By Jim Dower: WBO super bantamweight Nonito Donaire (31-1, 20 KO’s) showed why most boxing experts consider him the best fighter in the 122 pound division by stopping Jorge Arce (61-7-2, 46 KO’s) in the 3rd round and sending him into an early retirement at the Toyota Center in Houston, Texas. Arce, 33, never really stood a chance in this fight, as he was knocked down three separate times by the bigger Donaire. The end of the fight, if you want to call it that, came when Donaire hit Arce was a hard left hook to the head that put Arce down. The fight was then halted at 2:59 of the round. Arce was down twice in the 3rd, and once in the 2nd round. Arce was already in trouble before getting knocked out in the 3rd, as he’d already been knocked down in the round and was on unsteady feet when Donaire lined him up for his big finishing left hook to the head. After the bout was over, Arce said he was retiring from boxing and would spend his time with his family work on his job as a boxing broadcaster. Donaire looked great in this fight, as there really wasn’t much Arce could do because of Donaire’s powerful left hook. Each time Arce would attempt to get in close, Donaire would tag him with left hooks. 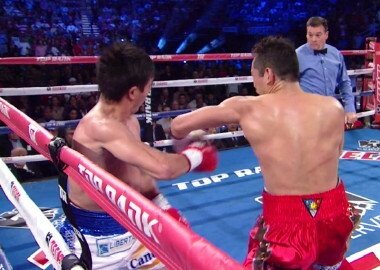 When Arce finally did get in close in the 2nd, Donaire hit him with a hard right hand that hurt him. It was a no win situation for Arce because he didn’t have the speed, height, reach, power or the youth to get the job done against Donaire. On the undercard, super bantamweight contender Victor Terrazas (35-2-1, 20 KO’s) defeated Juan Ruiz (23-12, 7 KO’s) by a close 8 round split decision. The final judges’ scores were 78-74 for Ruiz, 79-73 and 78-74 for Terrazas.